There are recipes for classic treats such as Toad-in-the-hole with porcini mushrooms and onion gravy, staple fish masterpieces such as Poached sea trout with sorrel hollandaise, and recipes for tasty favourites from your treasured holiday destinations: Seafood Paella, Goan Curry, Welsh Cawl and Clam Chowder. All this, plus a delicious range of puddings including Hot bread pudding with armagnac sauce, Lemon Possett and Poached pears with mulberries and mascarpone ice cream. With brand-new recipes and a fresh design, Coast to Coast contains Rick Stein’s most popular dishes drawn from many years of travelling the culinary globe. 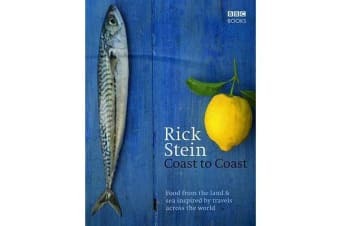 Easy to follow and quick to inspire, this cookbook will bring all the flavour of the coast into the comfort of your own home.